If you think this is just a rare accident, turn around and look about 25 feet behind you on the other side of the trail. You will see two other trees right next to each other, again a pine and an oak. In fact, as you walk throughout the entire park, you will see this happening again and again. Can you come up with an explanation for this unusual situation? Think about it for a moment and when you are ready to hear the answer, click below. Why are these two trees growing so close together? The answer involves human intervention. 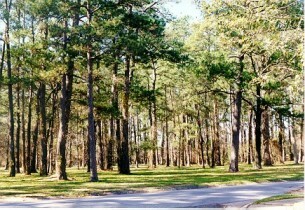 Before this 21-acre property was protected as a park, it was a pine forest that was mowed on a regular basis. The mowing equipment cut down all the small trees and plants before they had a chance to grow, but the equipment could not get close enough to the existing large pine trees to remove the new trees growing right next to them. So, the only seedlings that escaped the mower were the ones next to the pines. When two trees are growing next to each other, it is usually the case that the smaller one is a tree with larger leaves, like an oak. The large leaves make the oak seedling more adapted to growing slowly in a shady spot that a pine seedling would be. Why? Because the large surface area of the leaves allows it to absorb more of the limited amount of sunlight that filters through to the forest floor. The mowing stopped about 10 years ago and the understory has been allowed to grow as it normally would in a natural area. But the “buddy trees” remain to remind us of the past history of West 11th Street Park.